you might need some extra information. Why wait for a Visitor Guide to be mailed to you? Center City Visitor Information Center at 45 East Avenue. Open Monday-Friday from 8:30am - 5pm and Saturday from 9am - 2pm. Call 585-279-8300 or toll-free at 800-677-7282. Visitor Information Booth on the first floor of the Greater Rochester International Airport (near baggage claim area). Staffed Monday-Friday from 8am - 8pm, Saturday 10am - 6pm and Sunday 11am - 5pm. Brochures are available at all times to visitors. A satellite Tourist Information Center is also available for motorists at the Scottsville service area on the New York State Thruway in the eastbound lane just west of exit 46 (open May - October). Plus, we&apos;ll be getting out and about with our Bank of America Mobile Welcome Center at area events and festivals throughout the year. Basic visitor information is available upon request in Spanish, Portuguese, French, Italian, German, Japanese, Chinese, Korean. For 24-hour recorded current events and activities call 585-546-6810. TTY number for the convenience of deaf visitors is 585-546-8484. Fax number for visitor information requests is 585-232-4822. Write to: Visit Rochester, 45 East Avenue, Suite 400, Rochester, NY 14604-2294. For information by mail, please use the form below. 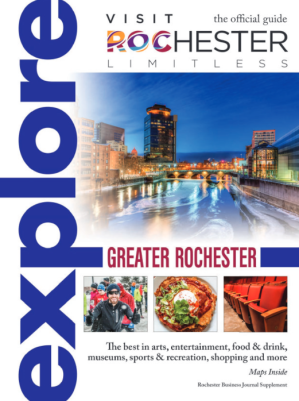 Thank you for your interest in visiting the Greater Rochester area.